Today was Dad’s first full day in Maine this year. We didn’t realize until last night that El El Frijoles isn’t open on Tuesdays in the fall, and our entire Tuesday plan hinged on eating at El El Frijoles. So we decided to swap our Tuesday and Wednesday plans, and we met up a bit earlier than our planned time of 8:00am. Two Cats was our breakfast destination. Rich’s egg and cheese sandwich on a hard roll came with extra-extra-extra-extra-crispy bacon. Finally someone gave him the crispy bacon he’s always asking for, but they went way over the top and cooked it till it was beyond black! Dad and I had granola with milk and shared a bowl of fruit. I ended up with triple-bergamot Earl Grey (one double-bergamot bag and one regular bag) while dad and Rich had coffee. After our meal, we spent some time looking through the Two Cats t-shirts for the right size and color per mom’s request. Our altered plans meant that today’s activity would be a climb up Dorr Mountain. Our route would provide an easy enough hike that would get dad up high for some views and allow us to take advantage of this perfectly clear blue-sky day. 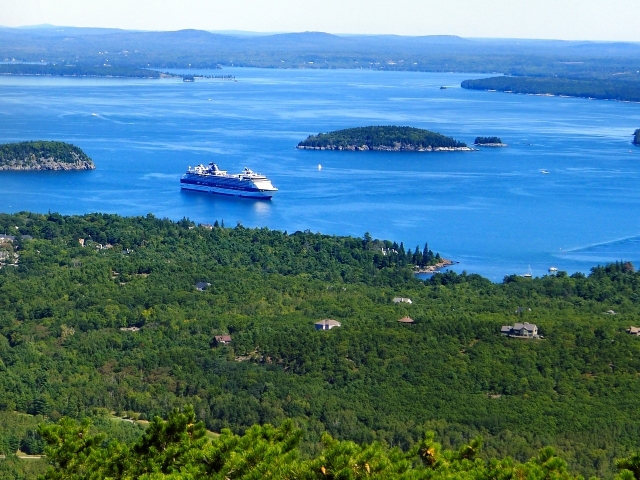 The 9:35 Sand Beach bus took us from the Bar Harbor village green to Sieur de Monts Spring. We had no choice but to listen to some super-enthusiastic Germans who had overtaken the back of the bus, and to overhear the chatter of women sitting ahead of us, one of whom was wearing a two foot high rainbow-colored Happy Birthday hat and another who claims to have been on at least 75 cruises. What’s better than the bus? I mean, free transportation and entertainment (of a sort) every time! The Jesup Trail and other memorial footpaths in the area of the Hemlock Road were part of George Dorr’s original system of “garden path” entranceways into the park. 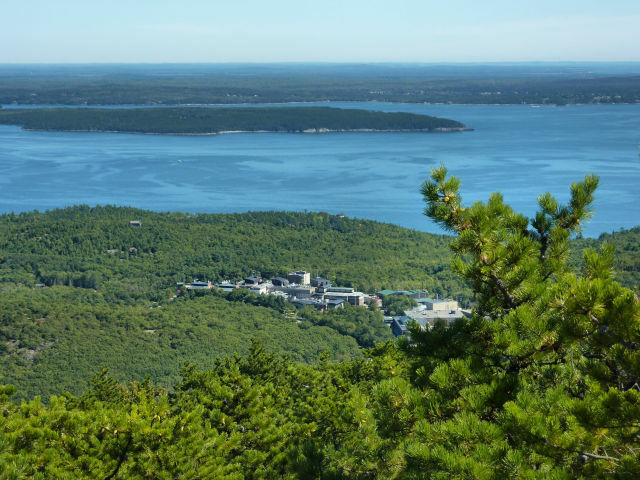 They were the realization of his vision to designate Sieur de Monts the heart of the park and to provide easy access from downtown Bar Harbor. Shortly after the Jesup Trail crosses the gravel path, the Hemlock Trail turns sharply off to the left and heads uphill through the hardwood forests that dominate the area following the 1947 fire. It’s a steep hike in spots, and rocky, but the lush surroundings make it feel like a real “walk in the park.” We heard the chatter of red squirrels as we passed by their hemlock homes. The trail extends west as far as the Gorge Path, but this time, rather than hiking its full length, we used the Hemlock Trail as a connector to the Dorr Mountain North Ridge Trail. 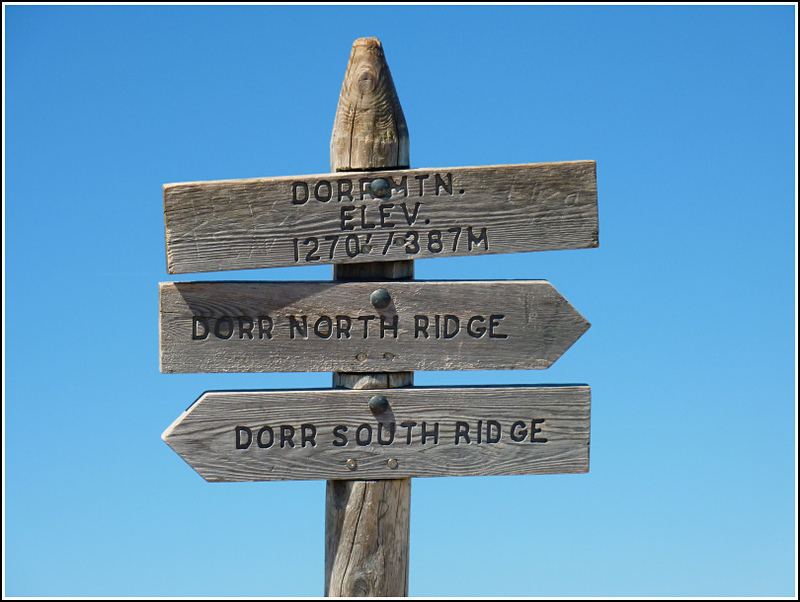 We turned left (south) at the intersection with the Dorr Mountain North Ridge Trail, and the true climbing began! It wasn’t such a struggle to me and Rich since it was mostly smooth-surface and much less vertical than Canon Brook, which beat the crap out of us on Sunday. But it was still strenuous and I’m sure dad was feeling it in his legs and feet by about halfway up. He never complained, of course, because he doesn’t. We just took plenty of breaks. 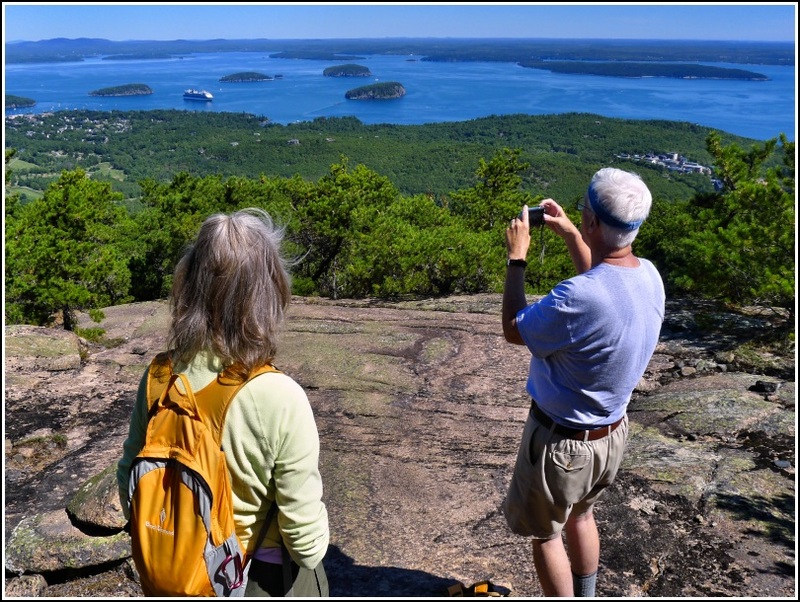 There are nonstop views from the ridgeline looking northeast over Bar Harbor and the bay, which in such clear conditions displays the Porcupines against its sparkling blue water. Is it one of those “dam” ships? A cruise ship was in the harbor as well. That’s typical for September. The behemoth ship appeared almost as large as some of the nearby islands. I was thrilled to see dad enjoying the hike and views as much as he was, pointing out interesting mosses and berries here and there, and taking photos as he went. It was a perfect day for views of the bay. 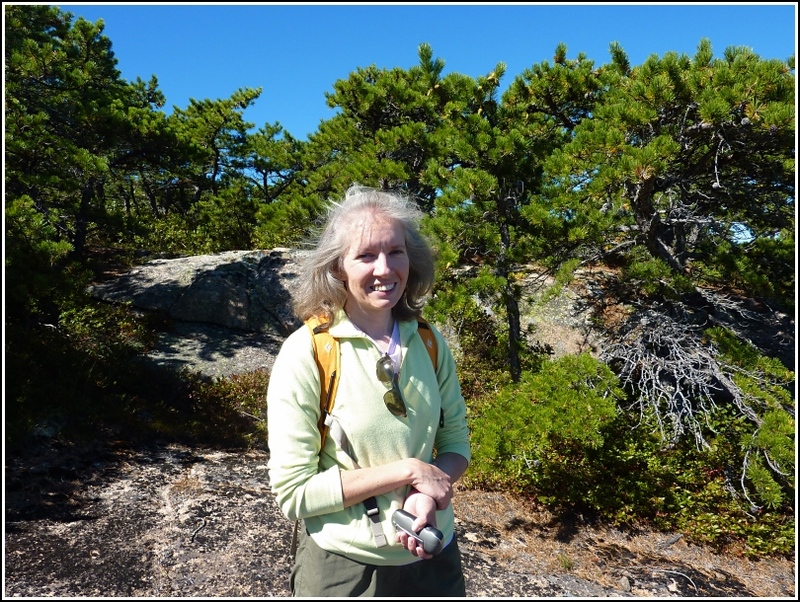 We reached the summit at the same time as a group of at least thirty hikers who had come up the South Ridge trail. Fortunately they and their loud mouths passed by quickly and we were left to enjoy the views, along with some snacks and water, in peace. 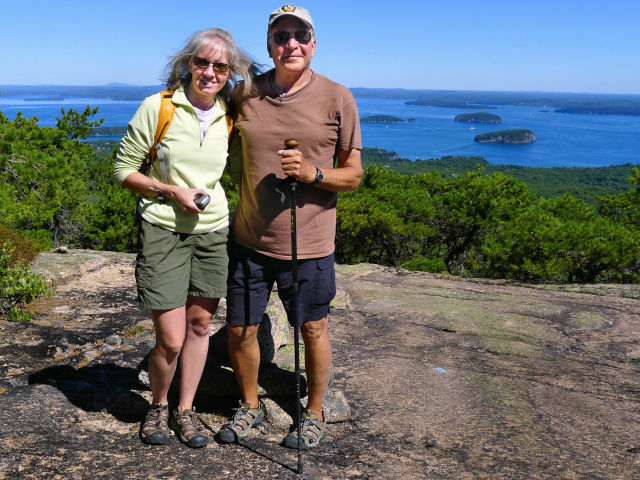 We watched a couple of “lifelong hikers” enjoying a sandwich and talking very quietly nearby. Another younger couple came by, visibly disoriented and confused and asking where the South Ridge trail was. They had been looking for a while, they said, and couldn’t find it. We pointed in the general direction and also offered a look at our map, to which the man said “Oh, we have a map. We just don’t know how to read it.” He and his wife set off again toward the North Ridge trail. It’s not Mt. Washington, but it’ll do! 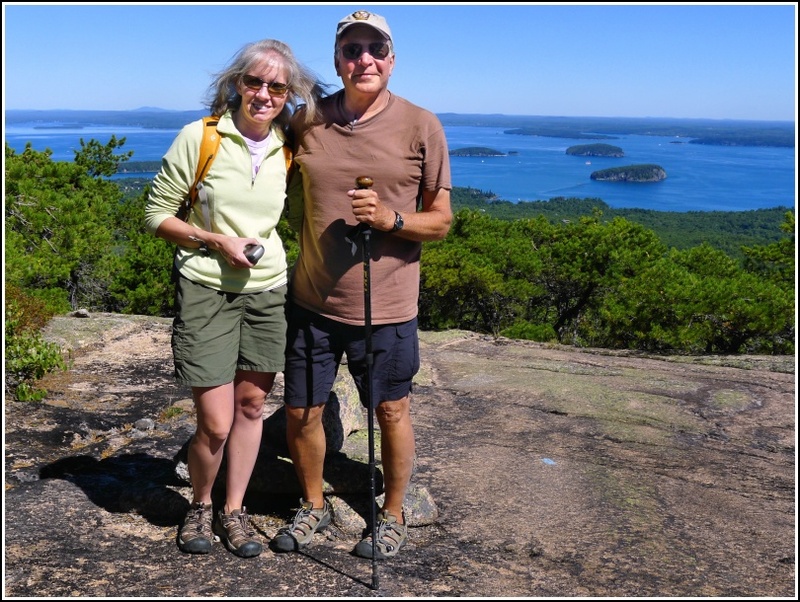 We commented on all the “ants” roaming around the trails at the summit of Cadillac. 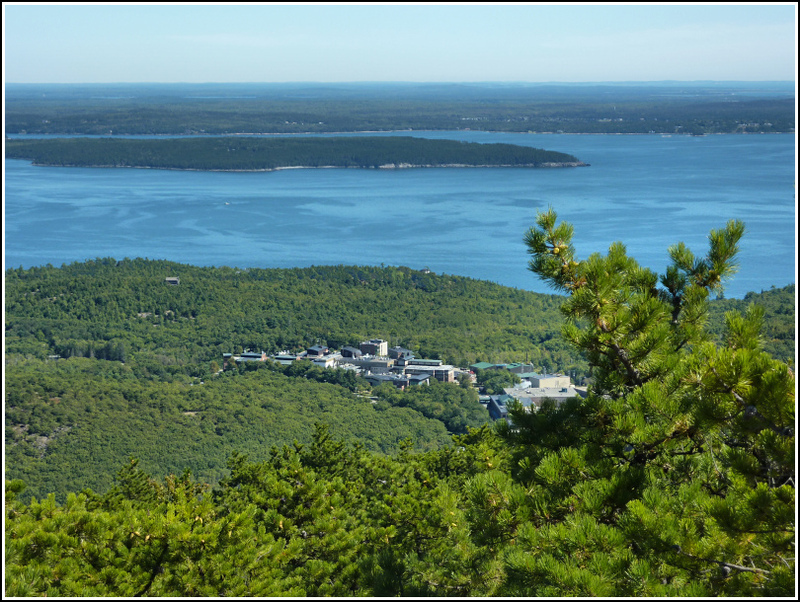 Acadia’s highest summit looms above even the summit of Dorr, but this realization didn’t diminish our accomplishment in any way. 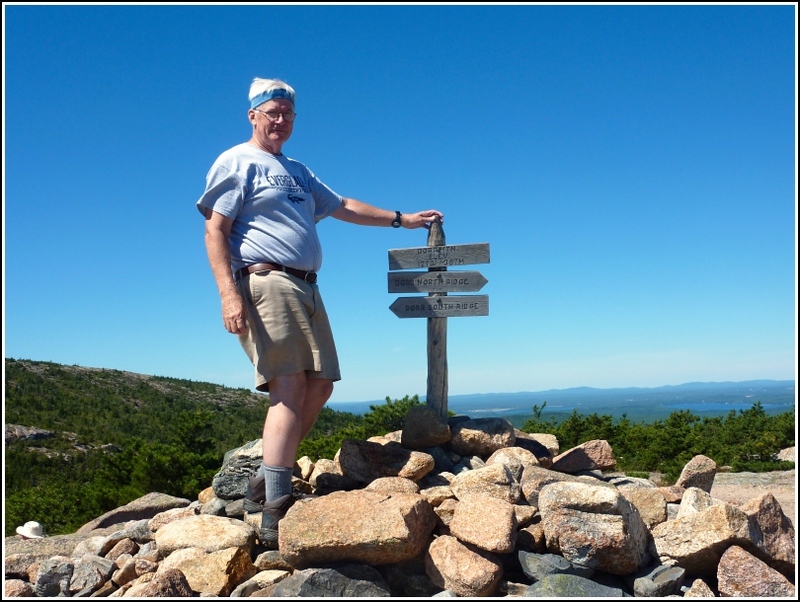 Dad stood atop the huge cairn at the summit sign for some photos. We shared another pack of cheece & peanut butter crackers. At least fifteen minutes had gone by when the lost man passed by again—this time without his wife—still apparently looking for the South Ridge Trail, even though I could clearly see both a cairn and a blue blaze on the trail from where I sat. I assume they eventually found it. 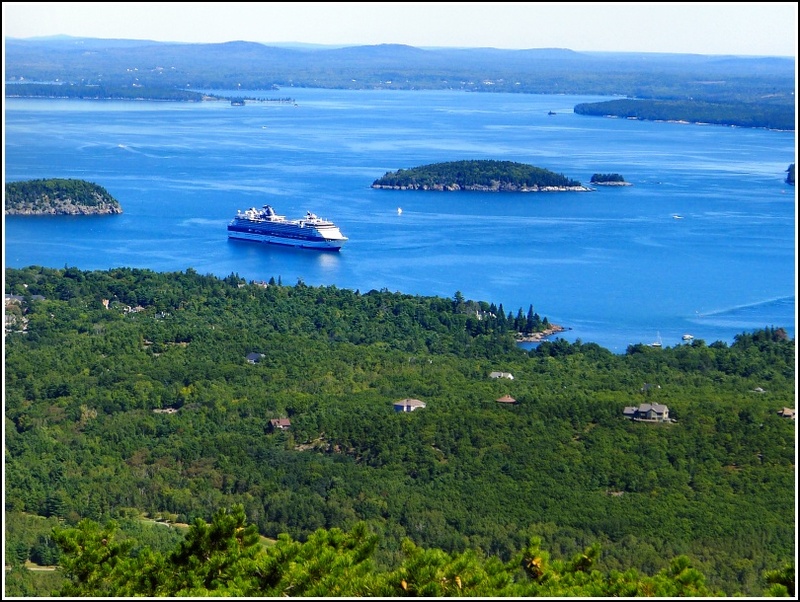 Hiking down the south ridges of mountains in Acadia is always a treat because of the constant views spread out before you. Grades are usually moderate to easy and as long as the granite is dry, footing is secure, so you can focus more on the beauty before you and less on each footfall. There are a few steep sections on this trail, and high steps that require caution. But after one last steep domed section the South Ridge Trail descends into pine woods and then drops down to intersect with the Canon Brook Trail—immediately opposite where we emerged on Sunday from the Dorr South Ridge extension trail. Of course we couldn’t resist showing dad a section of this abandoned trail, and it came at a convenient time for us to take a “natural break,” so we headed south another tenth of a mile through the growth of young pines and spruce and old birch forest and I found a convenient boulder. I would have loved to take dad all the way to Otter Creek, but that would have added another 0.4 miles one way. Back at Canon Brook, we followed the eastern half of the trail this time. 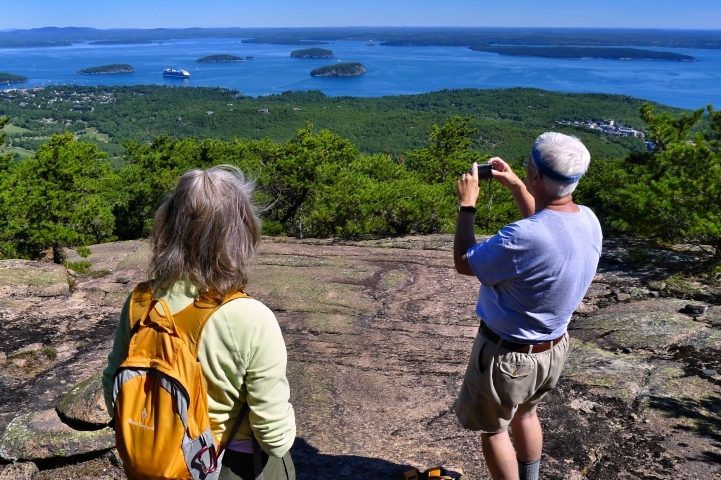 It is so radically different from the western half leading up Cadillac Mountain that it’s difficult to conceive of them being two halves of the same trail. The eastern portion is, at least currently, wide and mostly level, and is undergoing some reconstruction which has temporarily left it with a deeply eroded ditch along one side and a soft dirt tread. A dozen or so steps/water bars have been installed over a small hill, but most of the trail is easy, pleasant walking, if currently barren of vegetation and more woods road-like than trail-like. In a few years I’m sure it will recover and blend in with its surroundings like all trails here do. At its intersection with the Kane Path near the southern end of the Tarn, the Canon Brook trail turns east and follows a bogwalk out to the road and parking area. We instead continued on the Kane Path (also a bogwalk, here) past a few small ponds and marshes until we reached the southern tip of the Tarn, at which time we exited to Route 3. Just before the final turn east to Route 3 we noticed some hobblebush and its bright red berries in transition to black. The Kane Path along the western edge of the Tarn is a pick-your-way hike over fallen talus that’s a fun scramble on a day you’re up for the challenge, but we didn’t want to push things today. The walk along Route 3 was mercifully short, and there is a wide shoulder, but the sound and feel of traffic rushing by at 50+mph will always be a bit terrifying. We had a thought that we might be able to flag down a bus here, but none passed by. 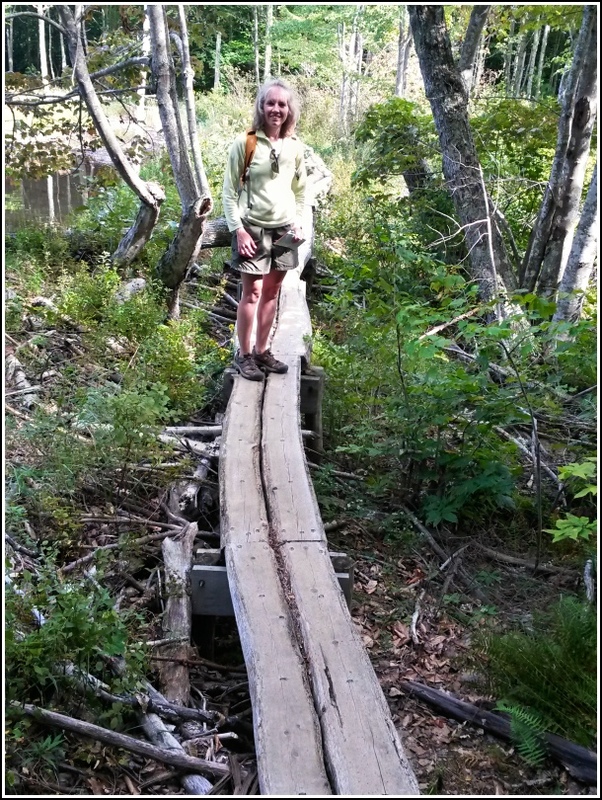 We soon reached the trail at the northern end of the tarn and headed into the woods again, directly toward Sieur de Monts. We caught the bus to the village green, after a wait of only about two minutes. One frequent bus passenger is a quirky, friendly, somewhat grubby man who apparently rides various bus routes all day and attempts to chat with the drivers. We heard one bus driver call him Gilbert, so that’s what we call him as well. Perhaps he’s a permanent fixture in town, or maybe he’s just rolling through this summer. In any case, he’s been a fellow passenger on several of our bus rides so far. And coincidentally, he was exiting a bus near Red Sky in Southwest Harbor just as we were parking along the street. “Hey, maybe he’s the chef!” We couldn’t help but chuckle at the thought because, well, we’ve seen some chefs, and you just never know. Whoever was the chef tonight did an excellent job. We’ve never had anything less than a superb meal at Red Sky. Rich and I shared a lamb taco as an appetizer. Dad wants nothing to do with lamb, but he found the polenta with mushrooms to his liking, as well as the roasted chicken from Sunset Acres Farm (the Bagaduce goat farm). Rich had Red Sky’s famous Peekytoe crabcakes, and I enjoyed the bright pink beet tagliatelle with goat cheese. We shared berries coated in creme anglais for dessert.